The Grampian Moorland Group shared the distressing images to warn the public. 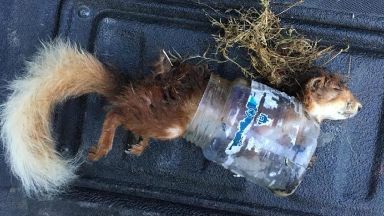 A red squirrel has died after getting trapped in a discarded plastic jar. The endangered animal was found at woods next to the busy A939. Grampian Moorland Group shared the image, taken by one of their gamekeepers when he came upon the distressing scene, to show people the tragic effects of not properly discarding rubbish. The group said it has seen an increase in the amount of litter in the area, and this jar seems to be one of many items thrown out of a passing car. Gamekeeper Craig Hepburn said: "It was found in upper donside next to the busy A939 - it has clearly been thrown out the window of a car. "We have noticed an increase in the amount of litter here, I found it on July 19. "We have a good population of red squirrels in this area and it makes us wonder how often things like this go unfounded. "We feel it is unacceptable for people to come into the countryside and throw their rubbish out showing no respect for the wildlife that lives here." The front half of the squirrel's body can be seen stuck inside the jar, and its head is sticking out through a cracked piece of plastic at the bottom. It appears as if the animal had attempted to get at food remains inside the jar, hurting itself trying to get back out. Saving Scotland's Red Squirrels responded to the incident, saying that it is "deeply distressing to see any animal suffer in this way". "It is tragic that a single piece of plastic has caused the death of a protected species," a spokesman said. "Litter is indiscriminate in its impact, and each thoughtless act can have serious consequences for our country's special wildlife." Scotland is home to around 120,000 red squirrels and 75% of the UK population are found here.